Jump into one of the longest lasting color trends by going with one of these popular short ombre hair ideas! Bright, blonde, caramel, sombre, or even blue, whatever your style, there is an ombre hair look for you. There is so much variety when it comes to ombre and the color combinations are endless. 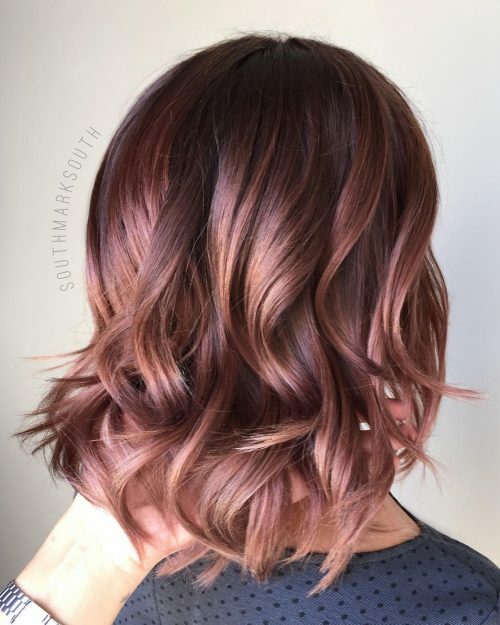 You can go with popular ombre tones like dark brown and golden honey, or spruce it up with more unique shades like cherry, pink, cotton candy, or the super hot rose gold color. There are even particular creations like mermaid, unicorn, rainbow, metallic platinum, and fiery fire burgundy to red to try. Although many ombre hair colors can be created DIY style, a professional colorist will add the perfect touch. Rock this two toned style for a next level confident look. The longer bob cut retains the classic quality of this modern hairstyle. A highly contrasting combination of dark and light brunette is an exciting one to try! These hues would complement tan and warm undertones beautifully. 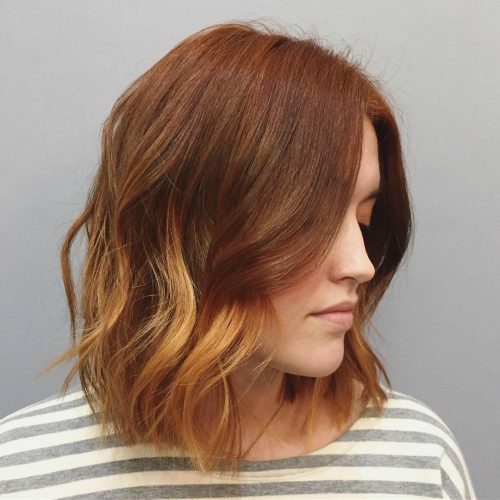 One of the hottest trends in the ombre world is this fiery copper color-melt that looks totally impressive on any length – short, medium, or long! This shade works best on warm to neutral skin tones. 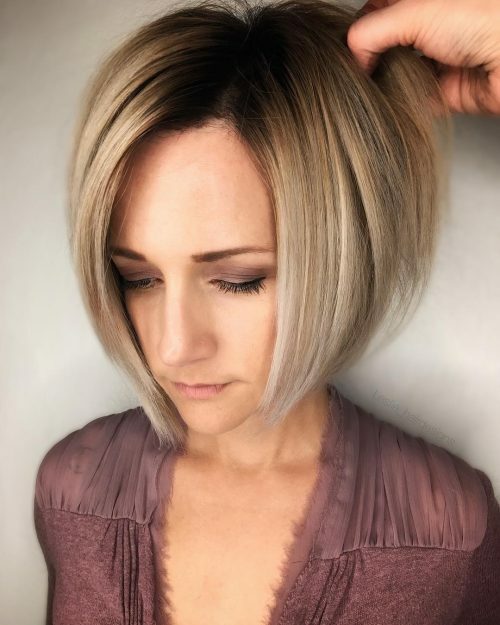 Strong fashion colors like a wonderful sapphire hue is a bit hard to maintain, so a great way to wear this is with a short haircut like this flattering straight bob. Get the cool beach waves on your hair for a great summer look! These trendy sun-kissed choppy strands would look best on any textured wavy hair. 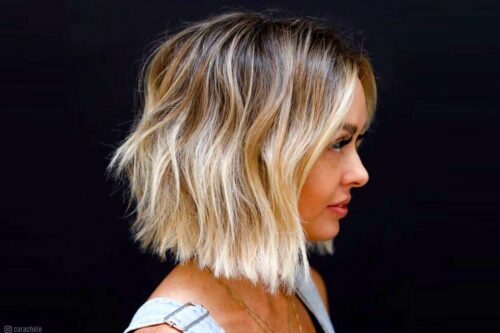 Soft-toned textured bob, effortless but stylish. This bob can be dressed up or dressed down and is perfect for any occasion or personality. I love the melt and blend of color + healthy shine that OWAY’s Hcolor creates. This gorgeous style suits many women from the bold and statement type to the wash and wear type. This beautiful color and cut create a shape to flatter the neck and collar bone whilst still leaving length to frame the face. OWAY’s sea salt spray is perfect for this style, a wash-and-wear turned night out style, this product gives effortless sass. I love this look because it’s a good balance between classic and edgy. 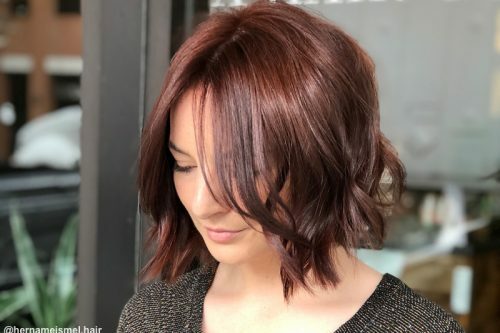 The textured bob is timeless, low maintenance, and still very in demand, while bright red is pretty daring and a high commitment. I think the simple cut makes the bold color very wearable and not so shocking. Her base is her natural color, so it’s pretty low maintenance as far as reds go. A textured bob is suitable for basically everyone. What makes it work for different face shapes is where the perimeter falls. If you want to draw attention away from a round face, the length should fall anywhere below the chin to lengthen the face. For a longer face or a larger forehead, you might want to consider a fringe to balance it out. For styling, I used a 1-inch curling iron, twisting the hair as I pull the iron through the ends to give it a piecey texture. Anyone with a slight wave to their hair could let this cut air dry with a little bit of styling foam for added texture. To me, I think this cut looks best when it isn’t styled perfectly. Bedhead is key to keeping it modern. For the color, her ends had to be lightened before applying the red. Bright red fades very quickly but is difficult to get out completely if you decide you want it gone. This client will need to come in to refresh her red ends every 6 weeks, and a color safe shampoo is necessary. I instructed her to wash her hair as little as possible, and to rinse it as cold as she can tolerate to seal in the color. Bright red hair is a lifestyle to say the least! Every 12 weeks she’ll need to bring up her grown out ombre with some highlights to keep the transition point between her base and the red right around eye level. I completed this entire look from color to cut. 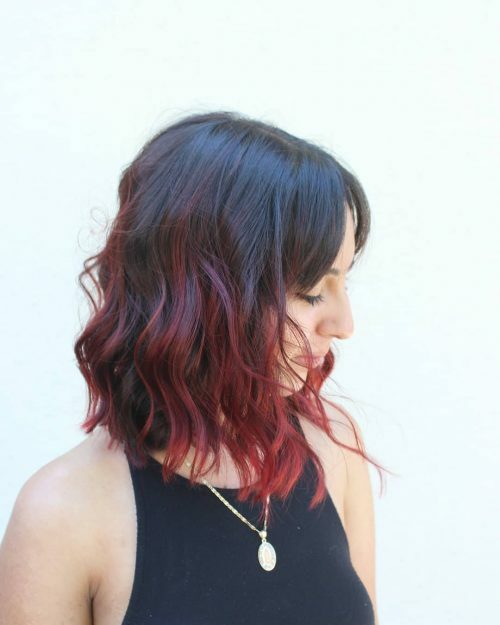 This is a short hair ombré – a pop of an intense red at her regrowth for vibrancy and depth. It fades into a light caramel color which melts into a soft blonde onto her ends. These colors melted together so beautifully! This matched perfectly creating a wildfire look for her! The cut is very sharp and blunt with no layers and straight across bangs as well. It’s curled to make a more elegant style out of this modern and sleek cut. Someone looking for this style would most likely be a free-spirited, college student who’s also trendy, modern, spontaneous, and intelligent at the same time. You need to love playing with color and be artsy! The most ideal face shape would be oval but heart, round, and square can also work wonderfully with this look. Products used are Davines treatment oil, Davines curl building serum, and Aveda air control for a light hold with a shiny look. The best products would be curl building serums or gels to help hold the bounce and keep the curl consistent. A volumizing product would be highly recommended as well to get the most out of this style and keep it from being flat. This look would work with almost every hair type! 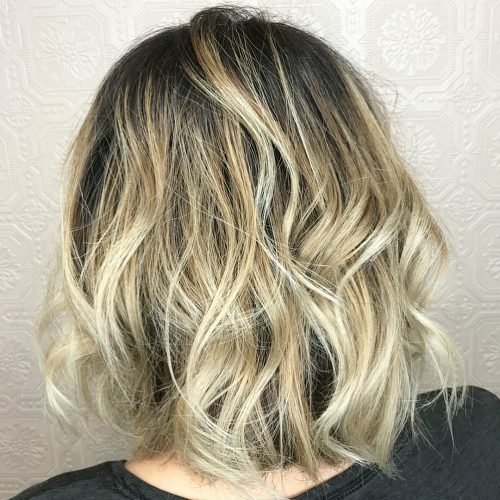 Extremely coarse and curly hair might have a harder time with this color because it wouldn’t blend as easy, but if done right you can make it work! 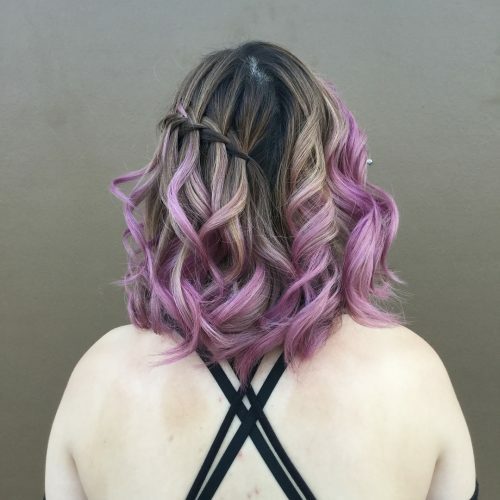 This is a fun mix of bright pinks and purples, placed together under a deep violet shadow root. The best thing about this color is the few hidden pops of blue! Adding a shadow root makes the look appear more lived-in and organic and makes the bright colors really pop. All products used were Pulp Riot. If you are thinking about having a fun look like this, consider the commitment it will take. Ask your stylist what you can do at home to best maintain these colors! Before committing to vivid colors, you have to make sure they fit into your lifestyle and budget! I love pairing this length of bob with beachy waves that are so in style. Bonus! The wavy hair will expose as much color as possible! A texture spray is key, and a great dry shampoo is a must to get you through with fewer washes to keep the color as long as possible! 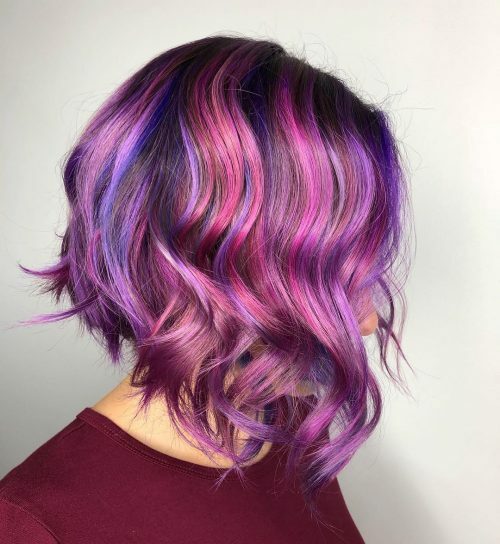 This is a “fashion color melt. I’m obsessed with reds and violets that blend and intertwine together. This works wonderfully and gives it that pop of contrast because there is a darker base going into those bold ends. The haircut we kept slightly above the shoulders and blunt to create thickness. I do a lot of face-framing to create a swept away, beach look which works beautifully when doing these bouncy beach wave curls. It is a lot of maintenance. Most of my clients come in between 3-6 weeks to get it touched up. If that’s not in your beauty budget, look at something not as bold as this. We use a color maintenance shampoo/conditioner and a moisturizing shampoos and conditioner. I alternate between both because I personally love the shine and softness it does to the hair. We use all Redken products for her hair to create everything you see. Colors like these love any product that is protein/moisture based. The color molecules are attracted to that hair which helps prolong your color. We use a heat protectant, leave in conditioner, and do deep conditioning treatments in the salon. 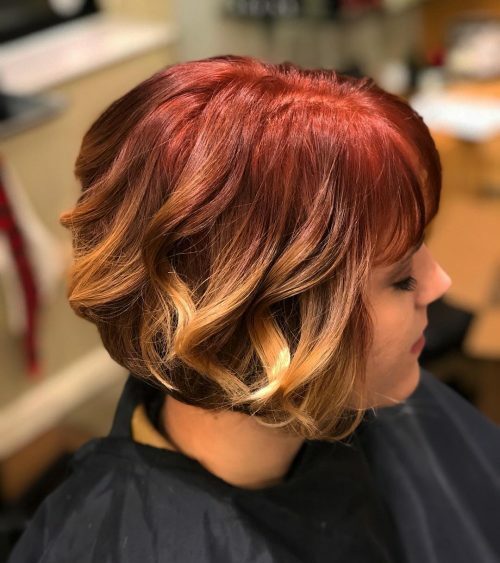 Your hair needs to be healthy for this look because if you aren’t already a lighter brown or blonde, we will have to lighten your hair to achieve this fiery red ends. This can be a versatile look. You can make it very edgy but it also can be a softer look. It’s all about how you dress, but it is a lifestyle change. First off, you need to think you can rock this like it’s no one else’s business. Confidence is key! It’ll bring out the pink in your skin, so be prepared to change your makeup routine or get a different foundation. It’s a whole new world. It can be a huge shock if you’ve never had red hair before. You’ll either love it or you’ll be kind of “ehhh” about it. 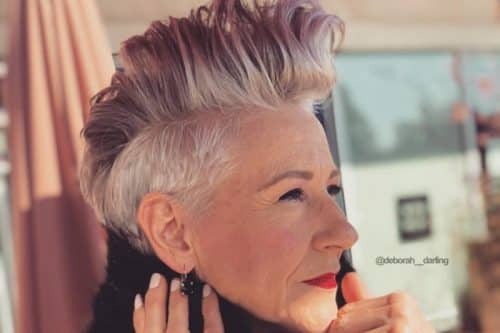 That stunning hair babe in the picture rocking this bold look is absolutely in love with it and feels totally amazing! I always say it doesn’t hurt to just go for it because you could come to find out it’s the color you need in your life! This look I fell in love with because she was completely blonde when I first processed her. While toning her, I use a darker tone to the root area and melted it down to this pretty sandy color. For cutting, we went short because she has thick hair and it’s summertime, and she wanted to feel the breeze. I used Babyliss curling iron for this stlye. While curling it, I switched to every curl differently so they wouldn’t connect when I run my fingers through it gently. 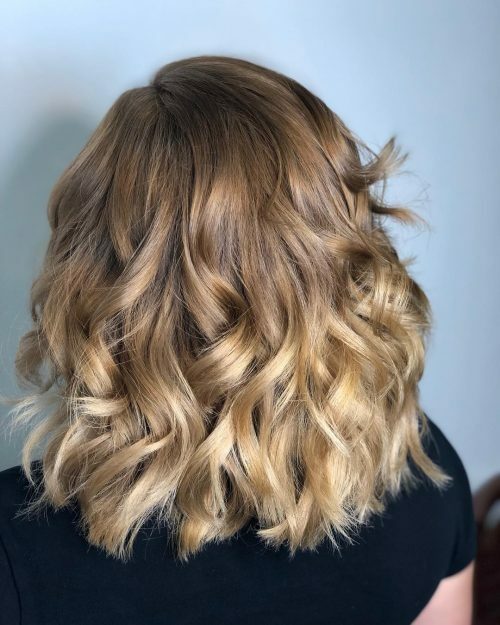 Use my favorite Paul Mitchell Blonde Me Shampoo and Conditioner or the Blue Joico Moisturizing Deep Conditioner because the hair will change texture after getting a style like this. She had a very pretty slim face shape, so this style went really well with her. 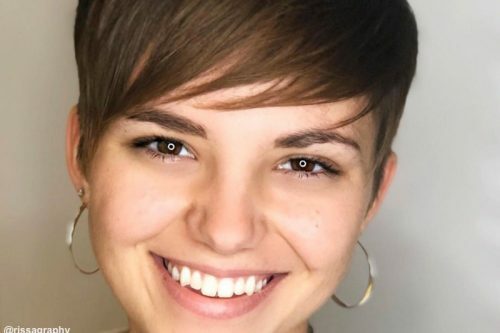 She’s a full-time mommy and works a lot, so having a short hairstyle makes it a bit easier to maintain than having it long and thick and all over the place. It’s an edgier take on a classic ombre. What’s super fun about it is that I used a semi permanent color, so it washes out fairly quickly. 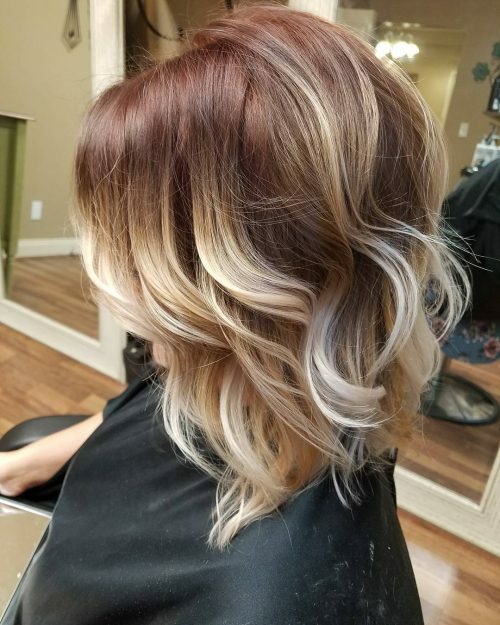 The client is either able to buy other colors or come to the salon to get a completely different look for a minimum cost. For someone who likes to change a lot, it’s the perfect technique!! The look is really for super easy hair or a person who likes doing her hair. For those who work out a lot or swim, think about the fact that they won’t be able to tie their hair, so it’s not for everyone! Also, keep the haircut look perfect by getting a haircut more often. Although on an everyday basis, it takes less time to do your hair! 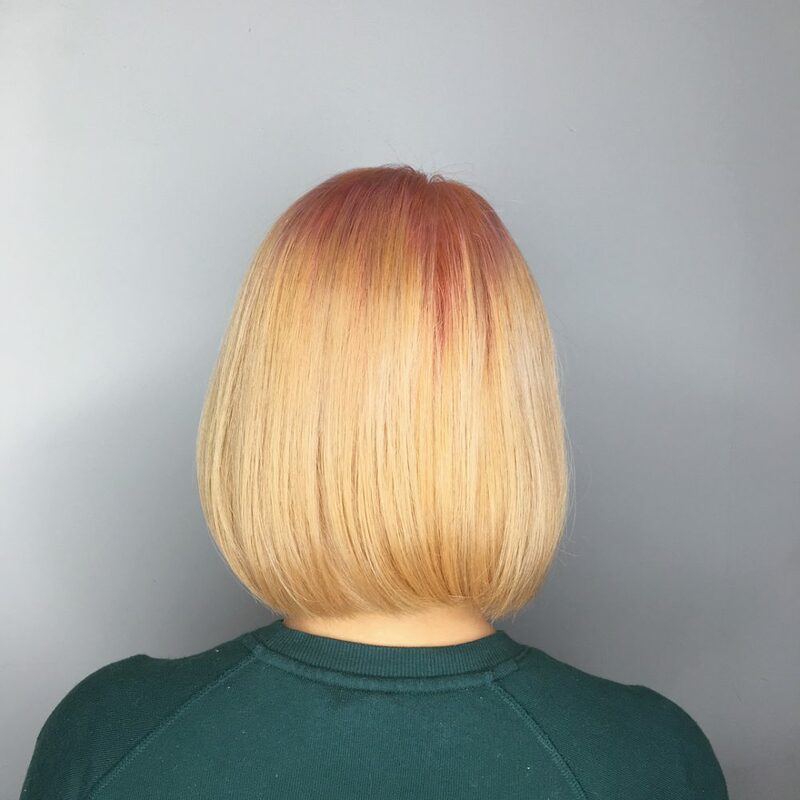 This rich rosy ombré look is not only fun but has its own personality! I love the combination of this color with the length of the haircut. It’s a perfect way to add some flavor to a shorter style, and that’s exactly what we were going for with this particular client. My client in the picture has fair skin and holds a business professional job and normally plays it safe with her color. This new look worked well with her business professional lifestyle and added some edge in her style. It can be worn sleek and straight for a more sophisticated look or loose and wavy for a fun and casual feel. Something to keep in mind: Rosier tones tend to fade faster so expect to come in to refresh your toner about a week sooner than you normally would in order to keep your new look on point! My first recommendation would be a quality shampoo and conditioner. Ensuring a style can last is the top priority for me, so I always make sure my clients have the right products to maintain their look. In regards to face shape, I’m of the opinion that if you love it then so will everyone else! At the end of the day, the better you feel about how you look the more you will exude confidence make the style your own, regardless of face and body shape! 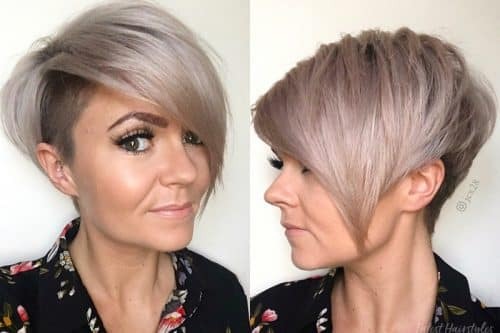 For this one specifically, it is an excellent choice for people with short hair wanting a bit of something extra without going crazy. Jewel tones work amazingly well on all skin types, and are a great choice for darker hair since they don’t require such extensive lightening to achieve. An ombre is also an awesome way to add lots of colour without having to deal with roots! 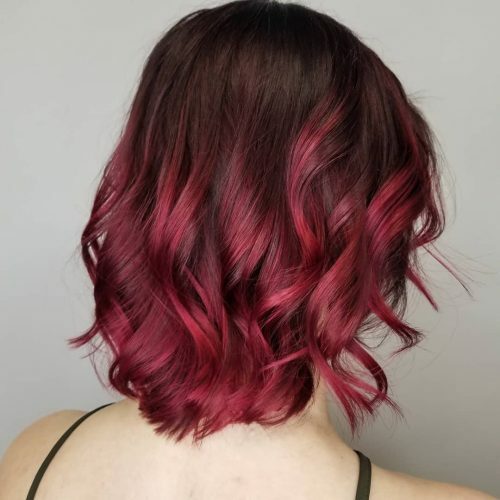 If I had to name this look color-wise, I would call it raspberry mocha swirl. It’s definitely a great blend of her natural hair color/root, fading into the raspberry colored ends. The best thing about doing this was the whole application process. It’s very soothing when you get in your groove. I’d also say I love the way the curls show off the dimension in the hair color and the waterfall braid complements it well. Keeps it fun yet professional and keeps those stubborn hairs from falling back into your face all day. If a client were considering this look I’d caution that it is a lengthy process. She started out at a level 4/5 dark brown (natural). To lift the hair light enough for the fashion colors to show up their true color the hair has to get quite light. This can take 2-3 sessions, so be patient! 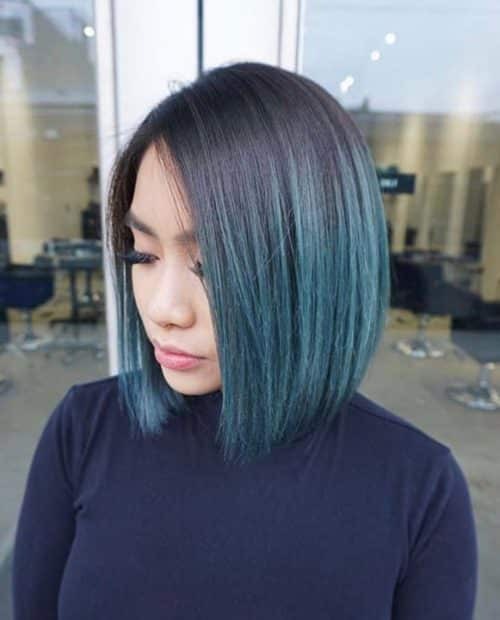 One issue with lightening the hair so much is that is can get quite porous, and although the color deposits nicely onto it, it will also fade a lot faster. (Feel free to ask your stylist for more of her own tips and tricks to help maintain the color). Cold or cool water washes will help prolong the color, and as always use heat protectants! Depending on the head of hair and the face wearing it you can play with highs and lows to best accentuate features. It really is a versatile style both cut and color. Styling can be done with a straightener or beach wave look, or a wand/curling iron to different curl shapes. This is a great cut for playing around with different styling options. Bobs are a lot of fun and depending on your lifestyle you can wear it long or short, up or down, layered or blunt, curly wavy or straight. The possibilities are endless. 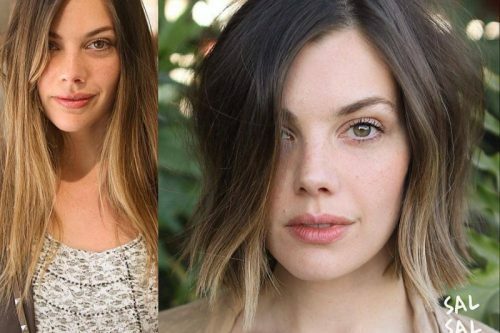 So whatever color combinations you choose, or leave it natural looking, know that the bob style is a great look! I’d describe this look as a sleek ombre bob. Since my client wanted to stay light, I created more of a root shadow in her hair rather than bringing the short ombre root down too far. Her hair is naturally fine and straight, so the hair falls into shape very easily. By using a graduation through the back, we added weight to the hair to make it look thicker! I recommended not taking the root down too far. 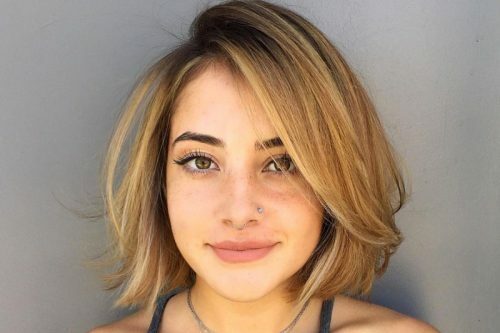 Because her hair is shorter, she would need to bring the blonde higher a lot quicker and she didn’t want to keep getting an overly warm band in the middle. We left the length sitting nicely on her shoulders so she still had room to curl the hair without it looking too short for her. My favorite thing about this look is the blend from the root black to blonde. It’s a seamless blend and the hair sits perfectly at the length we chose! I would describe this look as an almost reverse ombre with a subtle peach gradient. My favorite part is the root’s pink slowly transitioning into a more natural color. Reverse ombre is a trending combination that creates a very different look from conventional ombre hairstyles. The red to blonde gives a slight transition at the top. Pastels are notoriously difficult to maintain as it fades and may become brassy with each shampoo. This is totally fine for people who are okay with a gradual change in their hair’s color. If you’re not one of those people, one way to maintain the initial color would be to use a pink shampoo and pink conditioner. Additionally, since the hair becomes dry and damaged during the bleaching process, it is also recommended to care for the hair at home. This can be done by applying a hair repair mask or any hydrating leave-in treatment (typically an oil or cream). Most salons can provide this treatment service as well. After training for years at La Unica Salon and with De Lorenzo Haircare Australia, I know an ombré is something that will be on trend for many seasons to come! 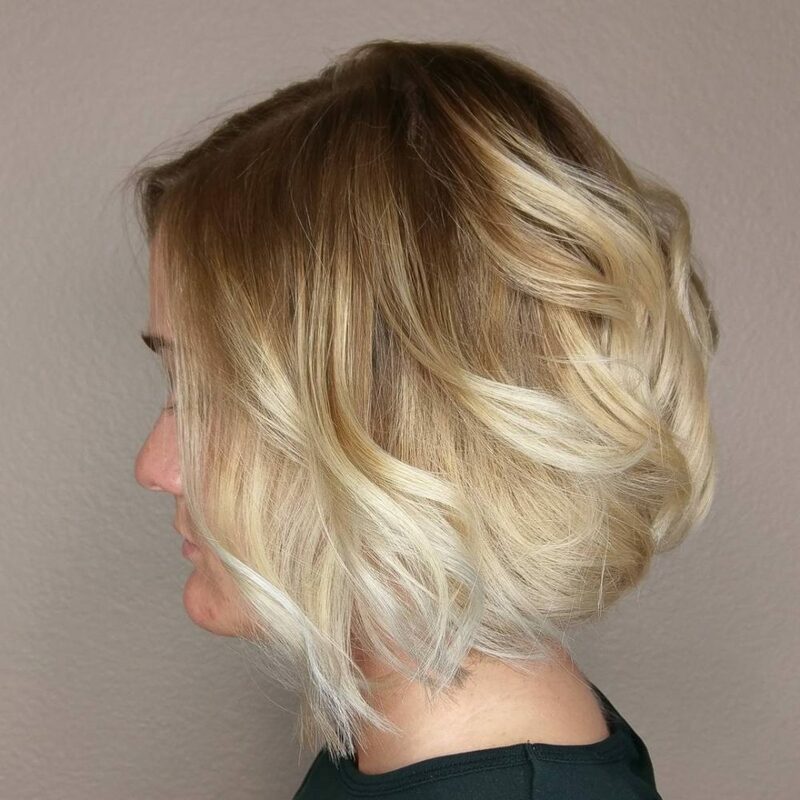 This look is a flawless blend of a rich brown root melting into a beautiful creamy blonde. If you are looking to try a brown to platinum blonde this one shines. My favorite thing about this gorgeous ombre color is how seamless it is and how it melts into each tone from dark to light. An ombré is a style that allows you to be that fun blonde and also a shiny, healthy brunette. 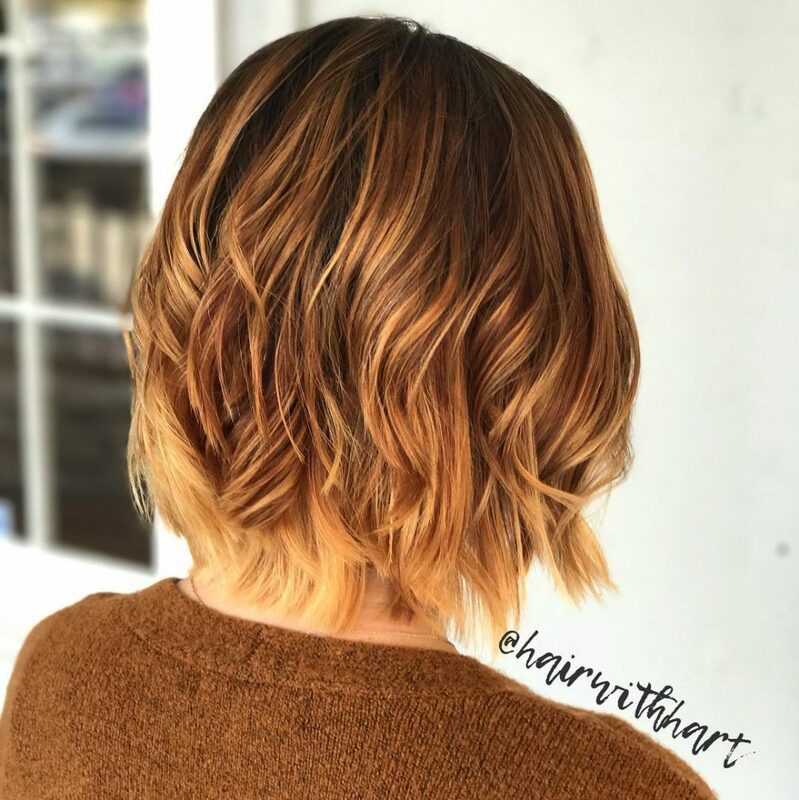 The best advice I could give for someone wanting to try shorter ombre hair would be to use professional products to ensure your hair doesn’t go brassy from day to day lifestyle choices (i.e. swimming, the sun). The Nova Fusion De Lorenzo Silver Shampoo and Conditioner are my go-to products for all of my blondies! They provide the best long-term results for clients in between visits. I always relate color to food, so I would describe this as Fun Dip Ombré! 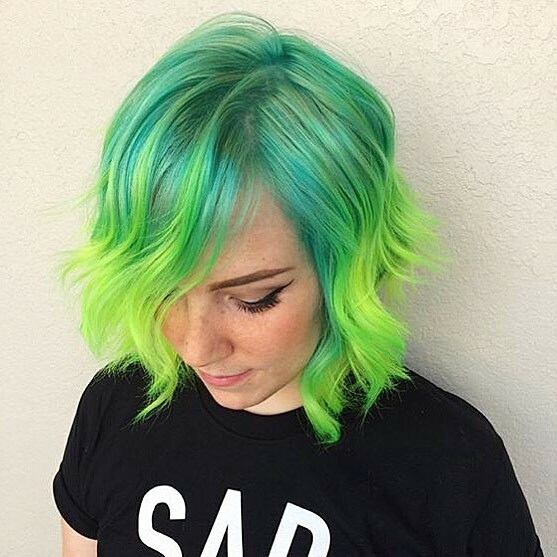 My favorite thing about this green and blue ombre style has to be the neon ends. Who doesn’t love neon?! This look is high maintenance. It’s important to use cold water, sulfate-free shampoos, and heat protectants with a look this vibrant. My favorite thing about ideas like this is the ability to fade over time so you have a blank canvas for your next look! This brown ombre look is effortless and chic. What I love about this look is how the contour around her face really opens up and brightens her face to emphasize her best features. I definitely think this color is considered somewhat low maintenance, which is exactly what my guest was looking for. She wanted to feel lighter and brighter but did not want to have something that she needed to touch up so frequently. 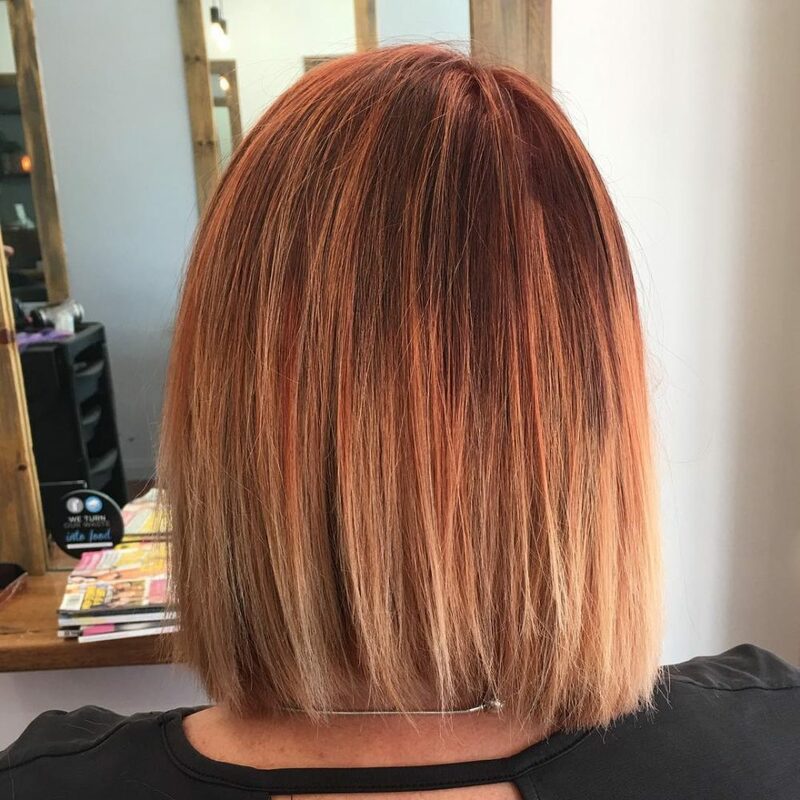 Always explain prior to the consult that the maintenance in between should be a color gloss that allows the client to spend minimal time in the salon. This client is an on-the-go mommy, so this look works best for her busy lifestyle. This look would be best described as a shadowed root blonde ombre. The added depth at the root creates a bolder effect than the natural tone in most cases. I love and chose this type of coloring application for my guest because she came in looking for something easy but beautiful. She is now a new mother and has very limited free time to spare. This look is extremely low maintenance due to the fact that the root area has a super seamless smudged effect for little to no grow out. Most of the time this look can be maintained with the proper at home care and salon visits three to four times a year! 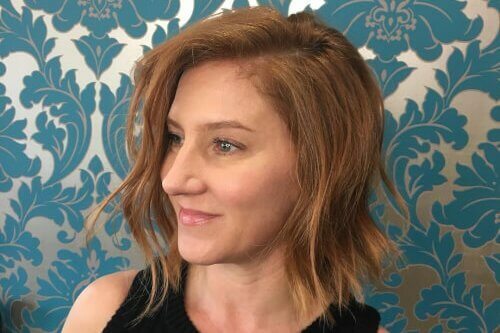 The lob is super trendy but simple enough for someone who isn’t hair savvy. Very minimal styling products are needed for this look if you have manageable texture. This style is an ideal option for anyone! It is a great overall look that most people can pull off. 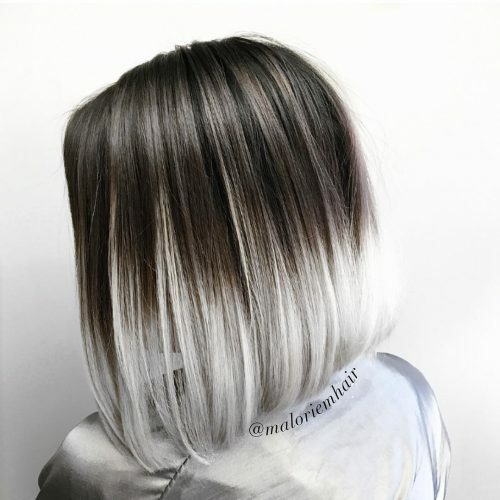 Silver ombre hair can be funky but elegant. It starts with the grey balayage which gives it not only lightness on the ends, but blended depth throughout the top. The look has a beautiful dark/light contrast. The blunt cut to the shoulders enhances thickness for a client with such fine hair. Styling with a loose wave gives it more body and texture. This look by far suits any color, any hair type and all face shapes. It can be worn straight, wavy or curly. Always talk to your stylist as some layering may be needed. As seen in the picture, a little trick is to finish this look off with one of my favorite products. A little sea salt spray added some much needed edge and texture to this amazing style. The metallic look is hard to polish off but when done right, looks absolutely gorgeous. This look is a first session balayage working to remove previous box color. We did a combo of balayage and foilyage to add some extra dimension. Balayage is my favorite service because the results can vary from super dramatic to super natural. I love how blended it is and how many dimensions you get. I also love that there are no lines as it grows out. So pretty! When going lighter from any box color, it is always a process. The same goes if your hair is super dark or coarse/resistant. 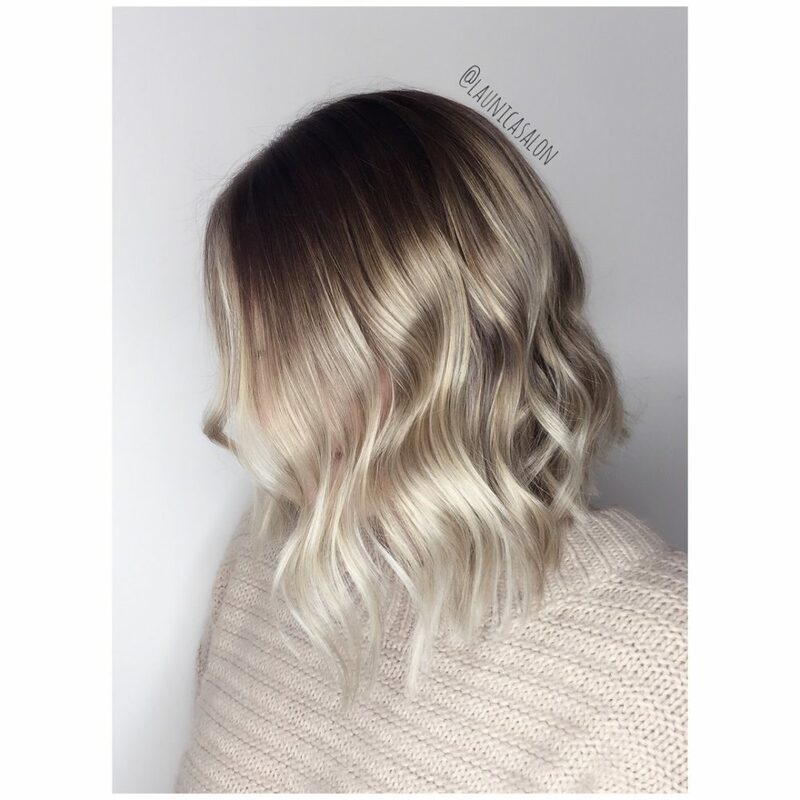 Balayage service is great for those that don’t like to be in the salon super often since there are no harsh lines of regrowth. Clients can typically go three months or longer between touch-ups, usually just needing a toner/refresher in between. 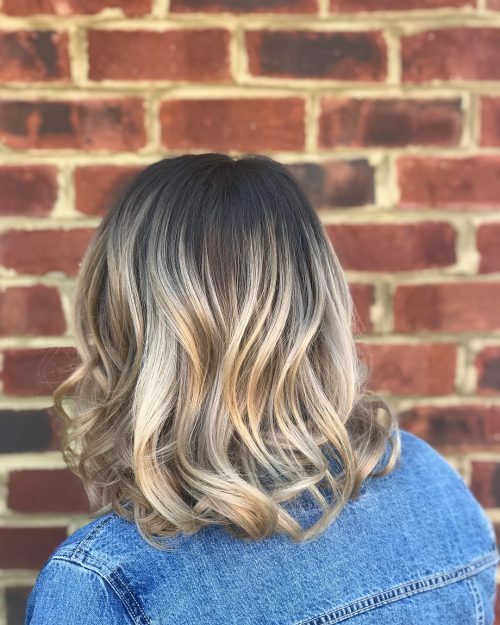 If it is your first balayage service, it’s important to remember it can take a few sessions to build the dimension and give you the lightness you desire to get the overall look. Trust the process! It really all depends on the haircut and color. The stylist should be able to place the lightener where it will accentuate your features or haircut best. This look can fit any personality or lifestyle for the most part, though it looks best when styled. When worn straight, all the colors will melt together giving a pretty sprayed effect. Curling it will show all the dimensions and pops of color. This look will definitely work best when used in conjunction with professional products to maintain the color. A good professional moisture shampoo, a professional leave-in conditioner, a heat protectant and a styling side will help the style look the best and maintain the hair’s integrity. Brown ombre hair is a solid choice. I would explain this look as a warm, autumn-toned red with tones of peach and cinnamon with a rich warm brown base. My favorite part of this red ombre is the warm tones. Being on the Gold Coast, a lot of my color work is blondes. When I get the chance to do a rich warm color, I love it! My advice would be GO FOR IT! Ombré works with all hair lengths. 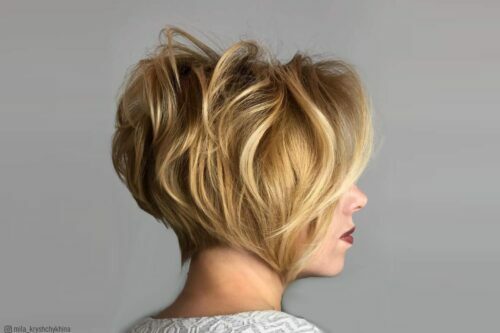 Short, cropped hair with a shadowed root area will give depth to the root area, adding texture and the illusion of thicker hair. Medium length hair is great for the same reason and you can wear it in a sleek bob or curl it for some extra texture. And we have all seen the perfect ombré on long, lush hair. This look is also relatively low maintenance if you match the darker base to the level of your natural color. 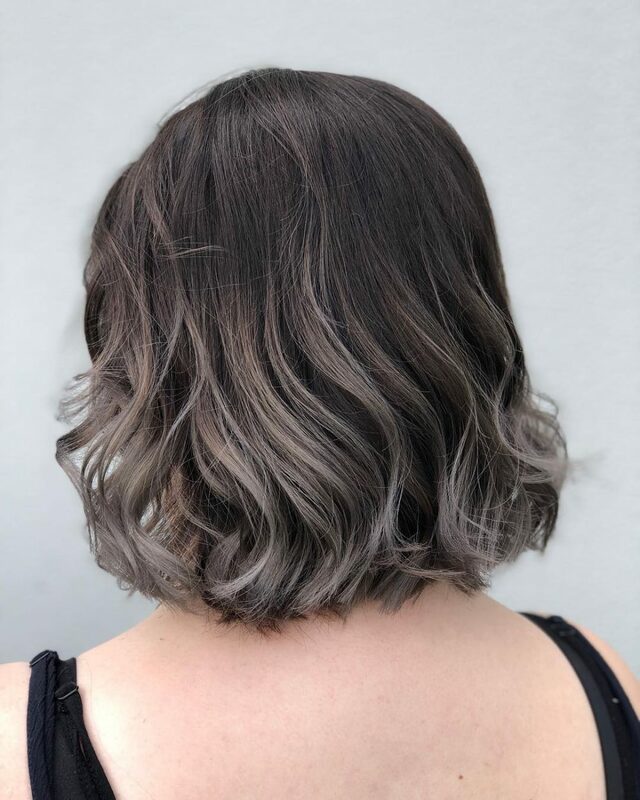 If you have greys, it is an easy job to just touch up the root area every five to six weeks, along with a toner through the lightened ends. This is a punk pixie look that is a combination of edgy and whimsical. I love that it’s easy to style cut and it was a huge transformation for this client. It really suits her and lets her personality shine. I recommend that a client considering this look takes this journey with a stylist they trust. 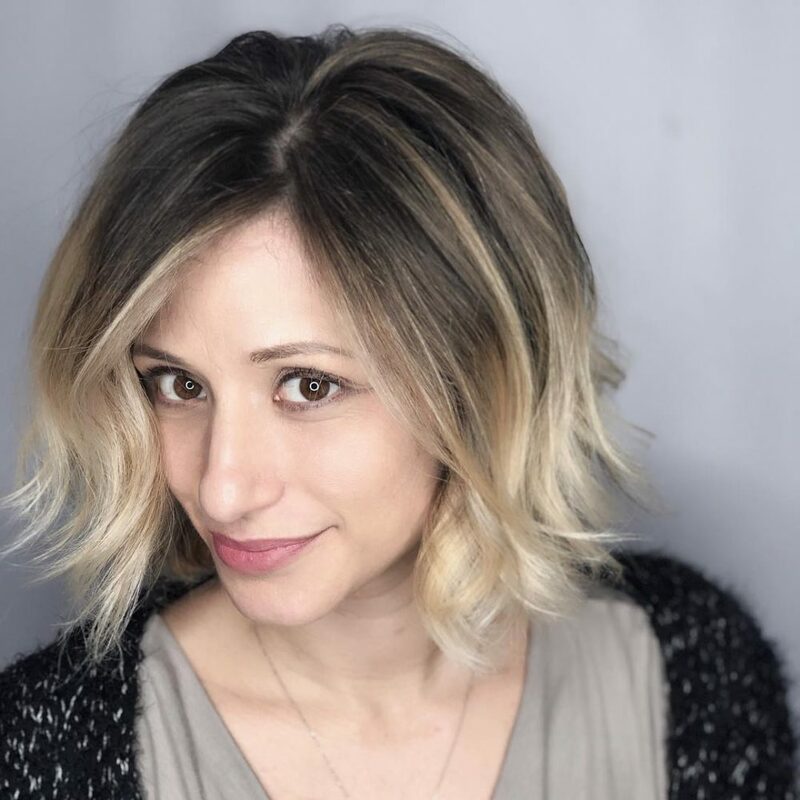 The day to day maintenance is pretty low (put in a little product, ruffle and go), but it does require a visit to your salon every four to six weeks to maintain the color and cut. 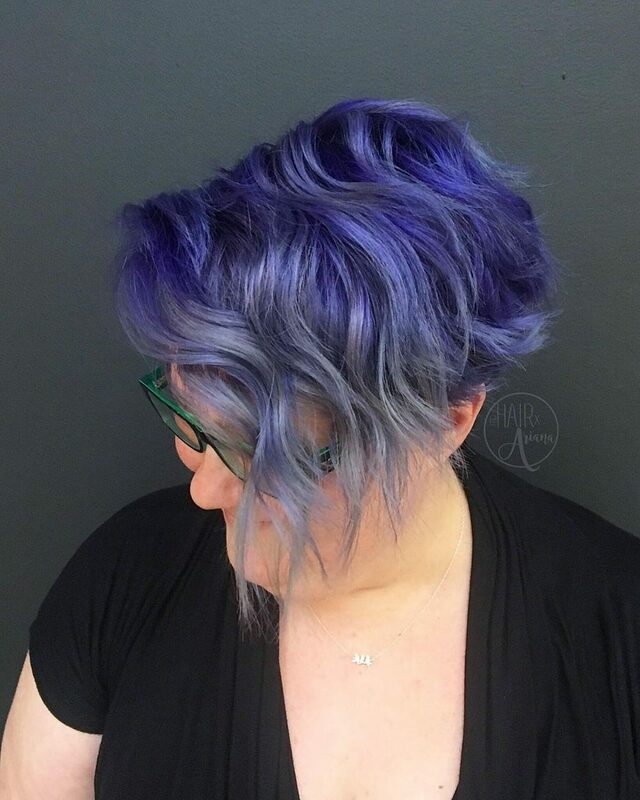 Anyone can rock a short pixie with funky colors like this blue to purple to silver color combination, you just need the right stylist to specialize the look for you. A good stylist can give you the look in the picture. A great stylist can personalize the look to you! Purple ombre hair ideas might be harder to find but it can be worth it. This look is fun and cute! My favorite thing about this look is that it lends itself to being more piecey and “messy” looking, which is a hot trend at the moment. This particular client really emphasized that she prefers to have more warm tones in her hair. That being said, this is where her hair lifted to on its own, without the assistance of a toner. You can’t see her face, but her complexion is very fair so warmer tones definitely suit her well! As far as the style specifically, it was created with a regular 1-inch curling iron. With lightened hair, it is important to use some kind of thermal protectant before applying the heat. 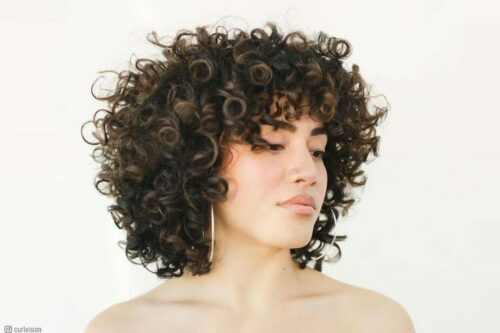 The key to perfecting this look, in my opinion, is using an oil or serum when finishing the style to piece out the curls, loosen them up, and make them appear softer. This also doubles as a gloss to make the hair look smooth, sleek and finished. My client is a fun, young college student and we all know that means several sleepless nights and minimal time to get ready in the morning. Lucky for her, she can also let her hair dry naturally and it still look beautiful, but the curling iron process for this look really is quick and simple. This look really lends itself to her fun and outgoing personality! Every color I do is specific to each client and their needs. That’s why I love doing balayage! So many different versions. For this one particular, we kept her natural base and wanted a more dramatic look, making the ends almost solid blonde. 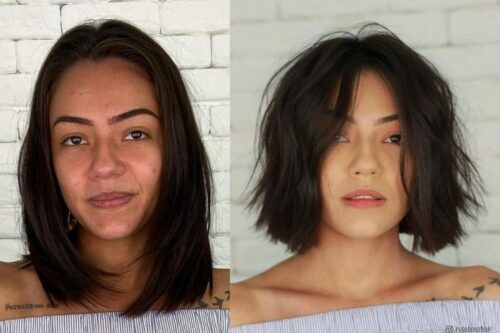 Yes, you can do this with short hair! I love to finish this style by using a great beachy sea salt spray. My favorite is Rockaway salt spray from R+Co. After I’m done curling, I mess it up a bit with my fingers…and done! This brown ombre is great for almost every hair type and can be done with a variety of colors. 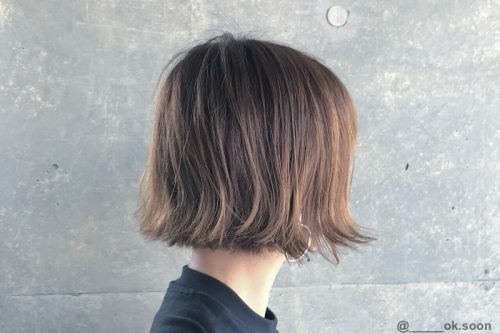 I would describe this as a subtle, longer bob haircut with balayage. My favorite aspect of this style is how well it blends. The colors, although drastically different, melt effortlessly into each other. 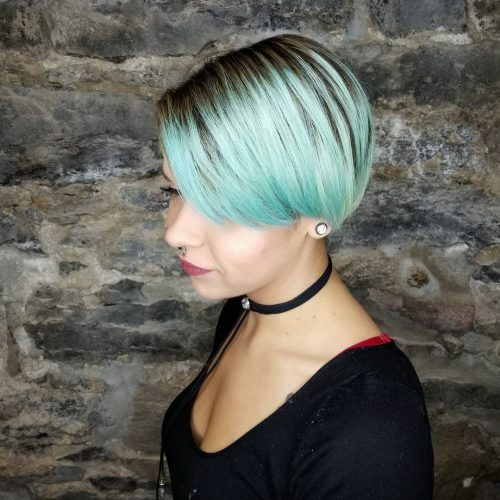 I achieved this color using Aveda Color, although whatever line you use could work. I used a green blue base to cut the red orange tones in her hair to produce a cooler-toned ombre. I recommend a color conserve everyday shampoo and a blue/purple-based conditioner to use once a week to maintain the ashy blonde. This style is perfect for clients who have busy schedules because this cut looks great styled straight, curly, scrunched or air dried. The color is very low upkeep, especially if you have darker roots already. 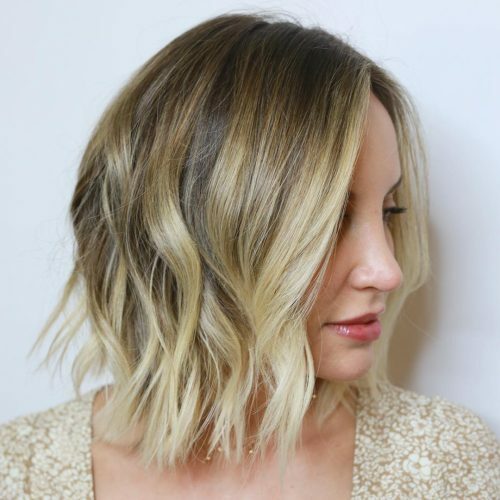 It allows you to let it grow out without seeing the line of demarcation as opposed to regular highlights, but still looks sassy by adding so much blonde. 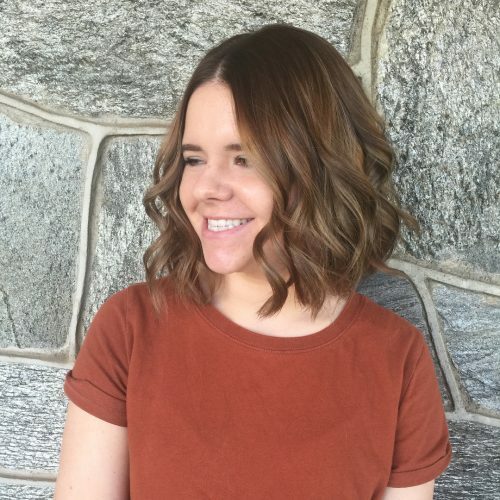 I love balayaging on short hair! Not many people think that they can achieve a lived-in look with shorter hair. I love this look because it gives you a flawless look without it looking like you put a ton of effort in. My favorite thing is the contrast that it gives you with a low maintenance color. I think this look is great for a client with more of a medium to thick hair type. My client pictured is on the thick side. It is a great look for the busy mom who doesn’t want to come in and see her stylist every six weeks for a touch-up. It’s the ideal look for someone who loves to get her hair done, but doesn’t have to ability to get in so often. I’d describe this look as a red to blonde. 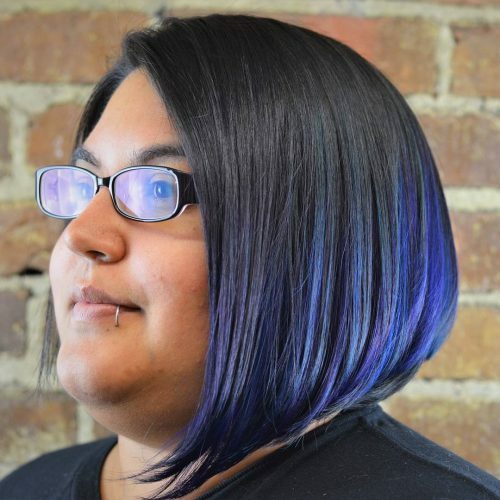 It’s great for girls who love their hair but want to change it up some by adding some color! I used Matrix Total Results Brass Off shampoo to keep it bright. I recommend switching out between it and Matix Color Obsessed shampoo and conditioner to maintain the red. I also used It’s A 10 Miracle Styling Potion, It’s A 10 Miracle Blow Dry Volumizer, and Design Me Dry Me Powder Blowdry In A Flash, as well as curled her hair with a 1-inch iron. I recommend this color and cut for just about anyone! I think it is very versatile. This is the perfect lined-in look. I love it because it’s versatile, giving you the perfect fun beachy look for spring/summer. We all would rather spend more time outside than in the salon, and have a bit of a root shadow is perfect for that. This is also a perfect length and color for sweater weather. 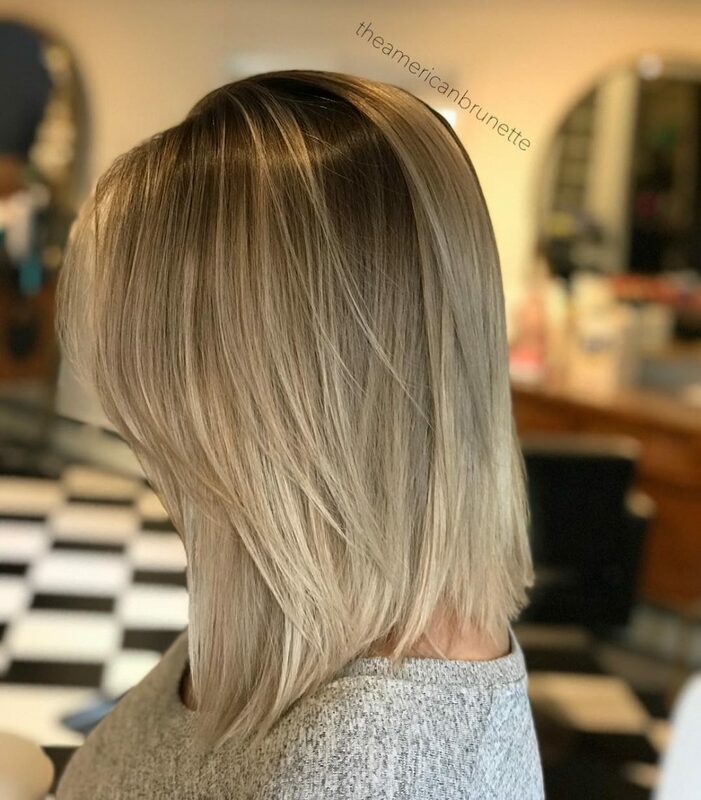 The length is fabulous with higher necks and chunky sweaters, the color brightens up those grey days with the beauty of the blonde on the ends. I strongly recommend that every blondie out there invests in a purple shampoo and conditioner. Imagine a pothole. The shampoo fills it like large rocks and the conditioner fills in gaps with the pebbles. I recommend Kevin Murphy’s Blonde.Angel shampoo and conditioner. Use a sea salt spray to get that textured finish on wet hair. I used Davines Sea Salt Spray before I blow dry. Generally, I recommend blow drying straight first to smoothen out the hair. Once dry, I add Kevin Murphy Young.Again oil and using a flat iron, I make waves in a halo section, leaving the underneath straight to maintain length. Once finished, ignore all the bits you think you need to go over and flip your head upside down and spray a texture spray. I love Kevin Murphy Bedroom.Hair or Davines Dry Texturizing Spray. Once you flip your head up, smooth everything out with your fingers for the “perfect” lived-in look! I recommend this look for anyone that has an on-the-go lifestyle. 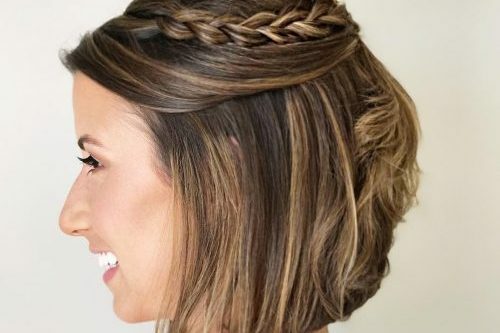 It is great for someone who doesn’t have too much time for the salon because this look only requires a visit once every three to six months. 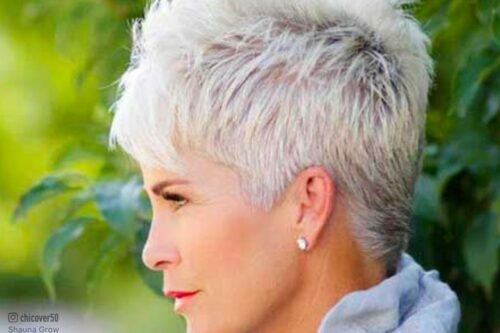 The great thing about this look is that no matter what texture your hair is, the cut will look fabulous. 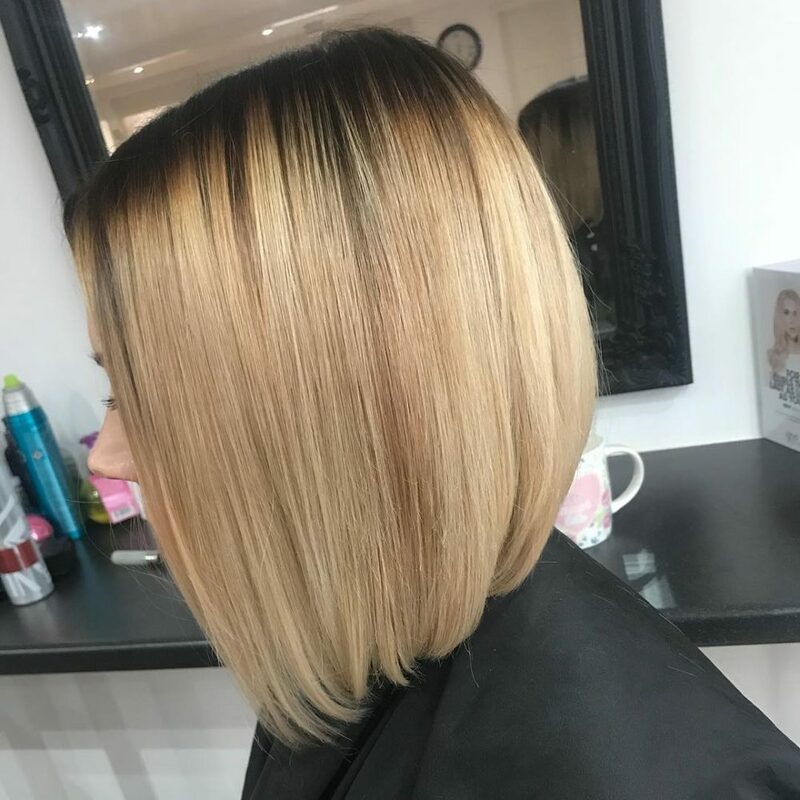 Even if you have finer hair (this client has quite thick hair), just don’t add layers but add different tones of blonde to make hair appear thicker. It’s also a great look for ladies with dark hair as it still keeps that beautiful natural color without overdoing the blonde. This look is so versatile. I play around with this look on all clients with every beautiful skin tone out there! This is a staple fall look. Our guest came in with a heavy balayage, which was great. However, fall was quickly approaching and she wanted to darken her look while still maintaining some dimension. Together we decided on a rich level 6 brown where I created a heavy shadow root. Not only did we decide to bring the darker, richer tones all over her roots, but we also decided to reverse-balayage in order to bring a few darker strands down towards her ends. 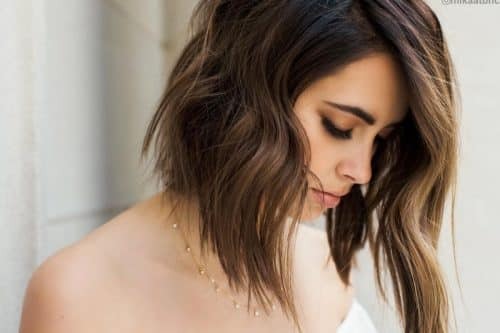 Our favorite thing about this look is that we were able to preserve some of the blonde while also creating a completely different and dimensional brunette look. We truly believe in preserving the overall integrity of our guests’ hair. That being said, there are a variety of products that we use to maintain and build healthy hair while performing color services. Treating your hair should not stop there, however. We recommend that every guest invests in a quality leave-in conditioner that they can use at home. This will help your hair in more ways than one! For example, after you shampoo and condition, apply your leave-in throughout your ends before you brush it. “It’s a 10” has a really great line. Their leave-in is our absolute favorite because it adds so much shine while also repairing, protecting and untangling your hair. Our guests notice a drastic difference in their hair after using this product and it is definitely worth a try! We have created this style in very similar ways for guests of all ages with very different hair textures! It is considered a low maintenance style because we are not directly lightening the roots. In past times when committing to a different style (i.e. highlights), you were also committing to coming into the salon every six to eight weeks to get it retouched. As our lives become more hectic, we stylists are completely aware. 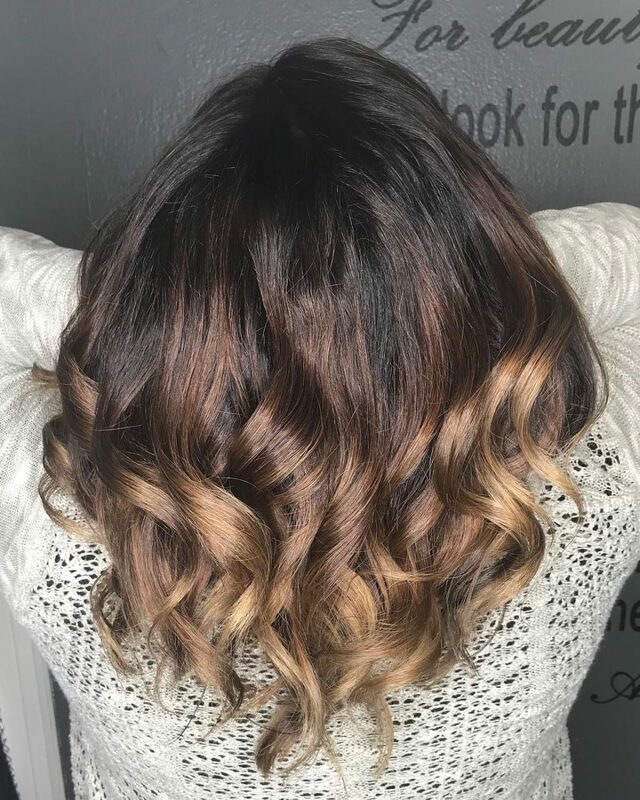 With ombre’s, the upkeep is minimal and we provide a look where our guests have the liberty, freedom, and control as to when they would like to get their hair done again. I recommend this look for anyone, no matter what age, who would like to change up their color as well as add some dimension. It is important to note that each guest determines how subtle or how drastic they would like their change to be. Own your boldness with a sleek bob haircut. Keep it straight and side swept for a sizzling finish. Adding soft caramel toned highlights through the ends of your hair gives it a touch of summer all year long. Light to medium skin tones that look great in purples, reds and browns wear this beautifully. Hair that is medium to thick and holds a curl well will make it easy to achieve this softly curled style. To create these soft curls that really show off your hair color, try using hot rollers! Section out hair and roll sections just from your ears down.